It’s a pleasure to get behind your friends from around world, in fact that’s the motive behind the breadth of the ESP Institute catalogue, but its truly a special feeling to represent your friends and your neighborhood at the same time. Producers Sonns (Alexandre Mouracade) and the mysterious Venice Beach native Tavish Graham are both long time friends of the ESP Institute family, we break bread, we take care of each other, and we cherish our collaborations more than anything, but we’re also neighbors. 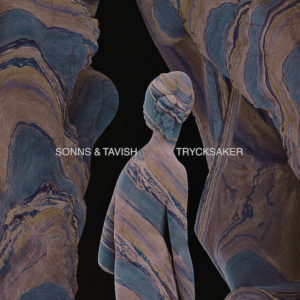 That said, ESP is proud to announce a homegrown endeavor, the debut of Sonns & Tavish. The two have long been stewards of the Los Angeles underground, but after loads of early morning banter and the camaraderie that comes with this smoke’n’strobe life, they’ve now committed their singular vision to print—two epic cuts that make us proud. Side A’s title track Trycksaker is a thumper, a mid-tempo big-drum-laden beast that chugs the whole way through carrying an array of eerie bleeps and fleeting sighs. Side B’s Roguish Days pulls together influences from various corners of the pair’s DJ repertoire, gelling a wicked breakbeat with a wormy acid bassline and even more exotic sighs, something that might possibly grow into a signature of sorts. This release is ready just in time for the Spring/Summer exploits, and we couldn’t be more proud to finally enjoy hearing these heavy-hitters in the club. Tip!